Don’t be confused. The reference to the church calendar isn’t about when the church softball team has its next game or the date for the next women’s craft night, or when the youth group will be up at camp. It isn’t even about when the next baptism or Bible study is happening. No. This is about the Church’s liturgical calendar, and how it keeps telling us the story of Salvation History all year, every day of every year. Take a closer look at a few important texts and see what I mean. According to the Psalmist, there is a way in which the very heavens themselves talk to us — though they don’t use words to do it. Many people may read this text and conclude that it implies something like, “You just look up at the beautiful sky and you can see that there is a God.” I won’t discount that beauty in creation points to the Creator, but I don’t think that’s the central point. At the beginning of the creation story in Genesis 1, there is another (and I think more potent) idea right in front of us about how the sky, the sun, the moon, and the stars “talk to us” though (depending on our ecclesial traditions, or lack of them) we may not have detected it. According to the book of Genesis, God has built messengers (and messages), and ways to keep track of what they are saying into the very fabric of the cosmos. The ancients figured this out long ago and began to see patterns in the sky itself; patterns that tell a story to those who are listening. Even St. Paul, when talking about those who have “never heard” quotes from Ps. 19 to remind us that, indeed, they have heard! 1 In the time of King Herod, after Jesus was born in Bethlehem of Judea, wise men from the East came to Jerusalem, 2 asking, “Where is the child who has been born king of the Jews? For we observed his star at its rising, and have come to pay him homage.” 3 When King Herod heard this, he was frightened, and all Jerusalem with him; 4 and calling together all the chief priests and scribes of the people, he inquired of them where the Messiah was to be born. 5 They told him, “In Bethlehem of Judea; for so it has been written by the prophet: 6 ‘And you, Bethlehem, in the land of Judah, are by no means least among the rulers of Judah; for from you shall come a ruler who is to shepherd my people Israel.’” 7 Then Herod secretly called for the wise men and learned from them the exact time when the star had appeared. — (NRSV – Emphasis added). Just one more text before I get to the final (and central) point, and the reason for writing this post. Contrary to popular misuse, this text is not about some pre-fall satanic rebellion in which 1/3 of the angels become demons in a primeval war against God. It’s pretty obviously about Jesus (see vv. 4-5), his mother Mary, and behind both of them, the people of God who are represented by both the mother and the child (who, as both male and female, and as “second Adam and second Eve”) stand for the whole of God’s covenant people — the image-bearing humanity — in different ways. The reason I reference it here is because of the way in which the chapter begins with “a great portent (sign) in heaven.” This is not a reference to the invisible realm, but rather the sky above. This is John saying something like, “The stars and planets all aligned and told a story about a woman, her son, and a dragon.” It’s a reference to the actual stars and planets in the visible sky above the Earth and the things that they “portend” (foreshadow, represent, or say beforehand) regarding some monumental event on the earth. Without starting down the rabbit trail of the conclusion that Jesus was likely born on Sept. 11, 3 B.C. (!! ), the point I want to make here is that there is really good reason to see the correlation between what was happening in “heaven” (the stars above) and what was happening on the Earth. This has been taken for granted for most of world history, including by God’s own people (based on God’s own word, as you’ve already read above). So — what does this have to do with the Church calendar (as noted in the title of the blog post)? For almost the entire history of Christianity, Christians have utilized recurrent cyclical patterns in the stars (because they are related to dates that come around every year) to plan out their cycles of worship. As the church has moved through two thousand years of history, events that have become important to marking moments of God’s faithfulness have been carefully and thoughtfully added to liturgical calendars across multiple traditions. A robust church calendar will mark key points of Salvation History in both Old and New Testaments (think Passover and other feasts in the O.T., and the birth, death, resurrection, and ascension of Jesus, and the day of Pentecost in the N.T. ), as well as key events in the history of Christianity (think of events such as the birth, ministry, or death of various Saints and Martyrs in Church history). The point is, Christians in traditions that utilize these liturgical calendars are able to keep telling the story of God’s work in the world day after day, month after month, year after year, and generation after generation. 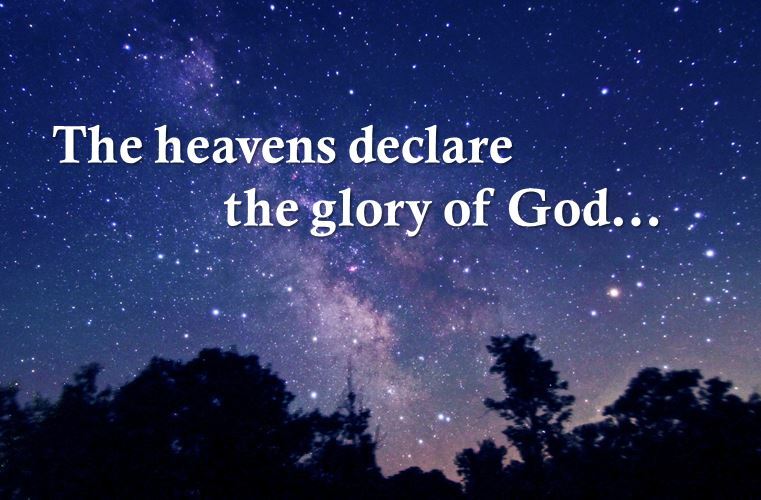 When they look up at the stars (by which they chart and then worshipfully navigate their way through the year in ways that help them to once again tell God’s salvation story), they will, in effect, join the host of “heavenly messengers” that keep on declaring the glory of God. Tom Wright, Matthew for Everyone, Part 1: Chapters 1-15 (London: Society for Promoting Christian Knowledge, 2004), 10. Michael S. Heiser: Naked Bible Podcast Episode 138: What Day was Jesus Born, Aired on 12/25/2016 – Excerpted from the written transcript HERE, p. 17. Hahn, Scott. Signs of Life: 40 Catholic Customs and Their Biblical Roots (Kindle Locations 674-679). The Crown Publishing Group. Kindle Edition.